Devore is French for 'devoured' or 'eaten'. These pieces all start with solid fabric,not yet 'burned out' or dyed. Each is a unique creation. 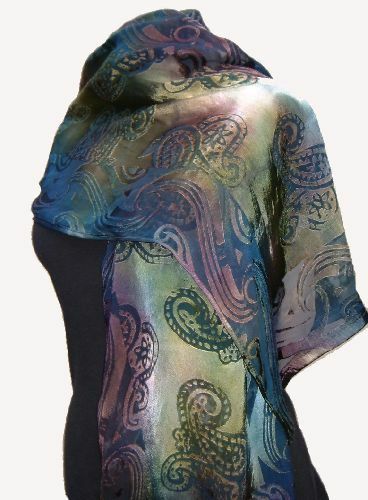 Here is a 15" x 70" Silk-rayon Satin Wrap. 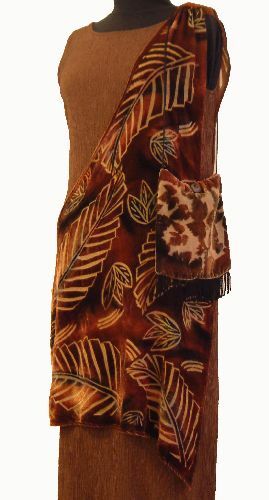 This sarong of Silk-rayon Velvet can be worn a few different ways to add an elegant finish to a simple garment. Every piece features different patterns & textures & colours. Laurie makes small hand bags for formal & everyday wear. Art accessories for your home decor. 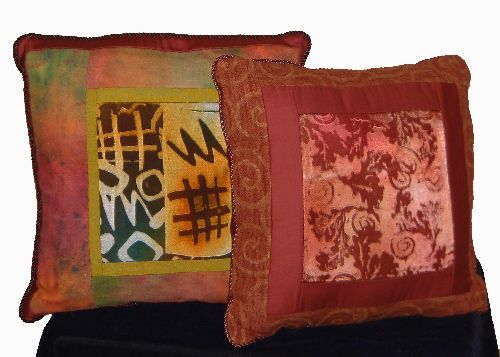 Laurie creates pillows using pieces of her hand-cut devore fabrics combined with other natural fabrics,(cotton, linen, hemp, rayon, etc.) some hand dyed and hand printed with her own hand carved rubber stamps. 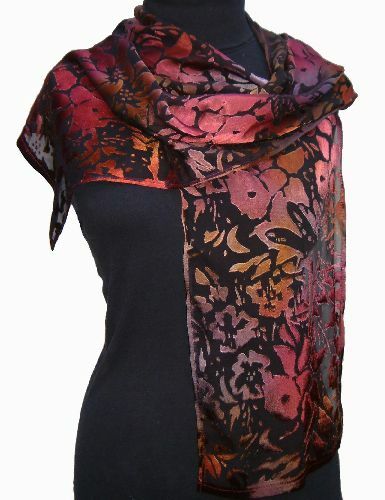 A Silk-rayon satin scarf to dress up a casual denim outfit or a power suit, always unique, one of a kind wearable art. Laurie's popular business of hand-carved Rubber stamps was accidently born out of doing potato stamps with her 3 young sons. 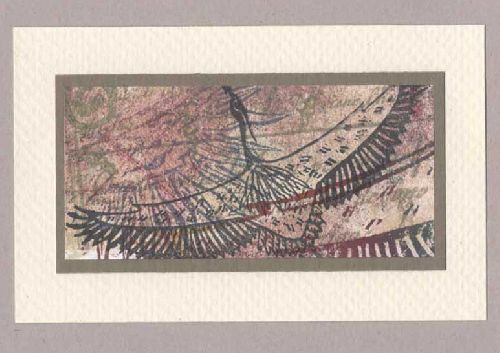 There are now hundreds of desigs from which she creates her art cards. Her loyal customers are always seeking her out to find out what's new, as well as getting custom stamps made for their own specific project needs.